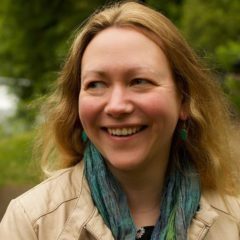 Helen Sedgwick explains the genesis of this unique short story: Several years before I wrote The Comet Seekers, I wrote a short story composed of independent flash fictions in which the characters were linked through a connection to the comets in the sky overhead. The resulting story, called ‘Searching For Comets’, was completed in 2011 (and published in Tramway’s Algebra) but over the years I kept feeling myself pulled back into it. When an idea keeps calling like that, I find I have to listen! So here it is, the short story of flash fictions that became a novel – I hope you enjoy reading it. they scramble to the top of Blackford Hill, all finger-nail mud and grass-stain knees and at the top they fall together on the bracken for skin-prickling. Below them city blocks rise high, their rooftop gardens patterned with people, but here they are alone, the only ones to have scaled the padlocked gates tonight. They peel off their coats, kick off their shoes and throw keys and mobiles carelessly to the ground. He’s got slow kisses, but already she can feel his eyes looking past her and she wants to do that, too – she wants to see something more than this. Then, as if he knows what she’s thinking, they roll apart to lie on their backs and look not at the bracken or the bench or the tracks on the dirt or the sprawling merger of the cities of Scotland, but up to the comets as they disintegrate overhead. They fracture and they split and burst, creating more bodies, more parts of themselves and it is beautiful – a shower of light, here, in this quiet corner of the spiral arm of the galaxy. 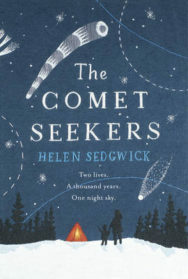 The Comet Seekers by Helen Sedgwick is out now (HB, £12.99) published by Harvill Secker.